The other batch of songs on the CDR from Girls from Tahiti was a set of demos from the Sturgeons. We didn't actually know this existed - and we're still somewhat questioning its authenticity. Does the Franklin Mint provide certificates of authenticity for tapes like this? That weird French blog seemingly corroborates the existence of an early Sturgeons demo from 1979. We believe this is the same tape, but we have our doubts. While we're big fans of the Forward Disorder/Punk Rock Virgins single, this demo is a lot ballsier, brasher and... maybe even better? We know we could ask Al about this, but instead we're going to close our eyes, picture this and keep on listening to this alleged Sturgeons demo. We're pleased that a few of our titles were reasonable close. Okay, maybe only one. Thanks to the same unnamed individual (who may or may not have saved a certain radio station we love) for passing us the cover of the original tape! I think it's authentic. The "primitive" drums and chord progressions sound like the 7". Now can you get the Sandwiches demo? It's authentic. Late 1980 I believe. Basement recording. The Sandwiches demo is available, CCPS just has to pick it up. 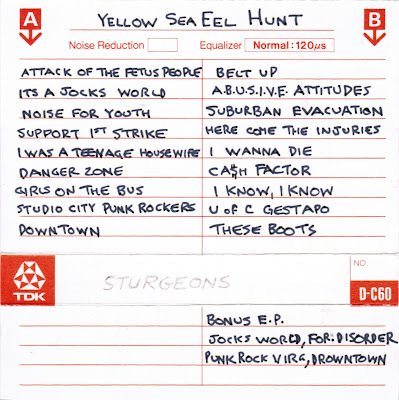 The tape was originally called Yellow Sea Eel Hunt. A few songs from it are MIA here - drunken covers of DOwntown and These Boots Are Made For Walking, and one other original, "Studio City Punk Rockers".